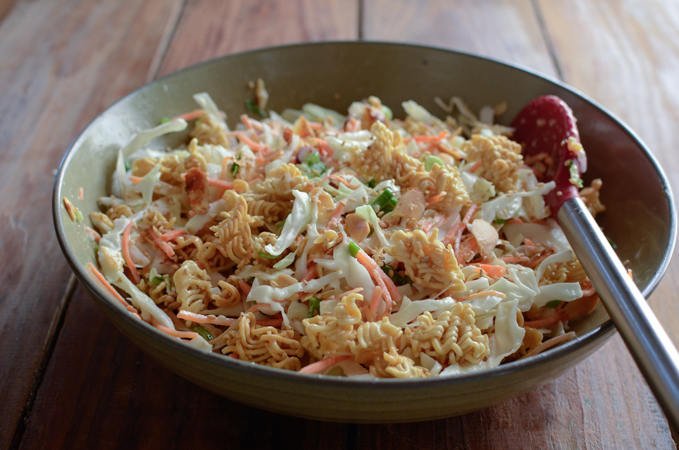 Cabbage ramen salad is one of the oriental style salad recipes I have often ate when I first came to U.S 25 years ago. Every potluck party I went, someone always brought this salad. Some were really good, and the other were very oily or too sweet. I was surprised to see how cheap the ramen was first, and then even more surprised how horrible it tasted after I tasted when it was made into noodle soup. No wonder people used only the noodle part of ramen package. Toasting the ramen noodle in advance gives incredible texture and nuttiness. I added sliced almonds for even better tastes. These toasted ramen noodles brought me my childhood memory. I often ate the toasted ramen noodles as a snack growing up. It was popular snack for young kids many years ago in Korea and it still is. 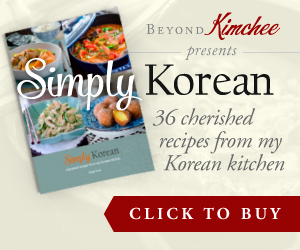 Many Korean kids still love to munch these curly noodle pieces. My kids love them, too. So yummy! Dressing is simple and very quick to put together. All you have to do is slice the cabbage and carrots very thinly, but you can always use a bag of coleslaw that you can buy at the store to make life easier. This cabbage ramen salad is not oily nor overly sweet. The noodle is buttery, nutty, and crunchy, it goes perfectly with cabbage. I loved how it tasted and I could eat the entire batch of salad myself. I can picture it matches beautifully with any BBQ meal or summer potluck party. Just nice~! Break the ramen noodles into bite size chunks and spread over a baking pan. Mix in almond slices. Drizzle the melted butter over and toss well. 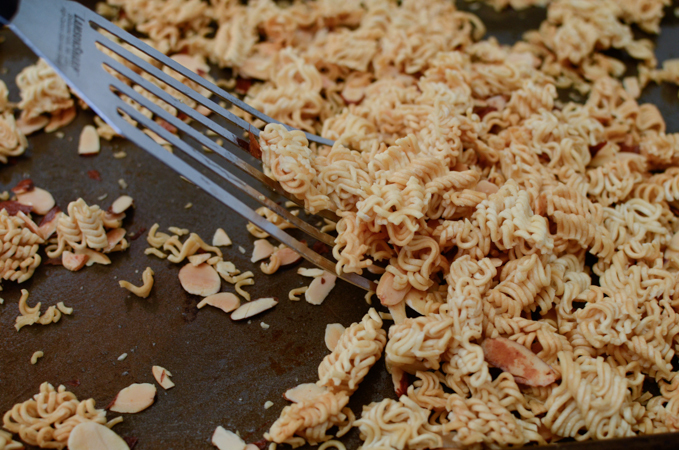 Toast the noodles and almonds for 12-15 minutes until golden brown. Remove from the oven and set aside to cool. 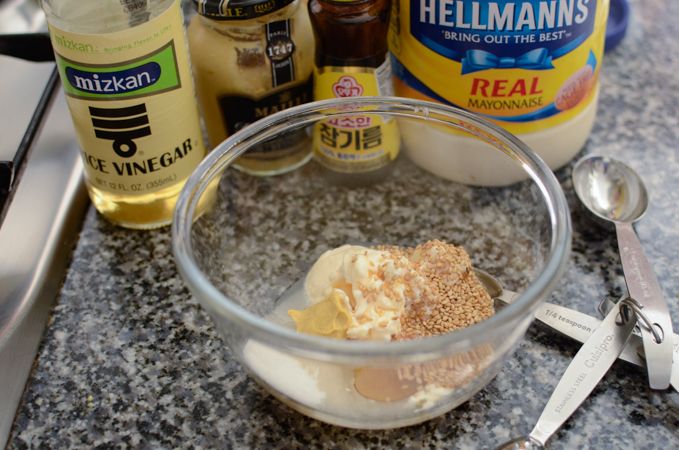 To make the dressing; combine all the ingredients in a small mixing bowl and whisk well. 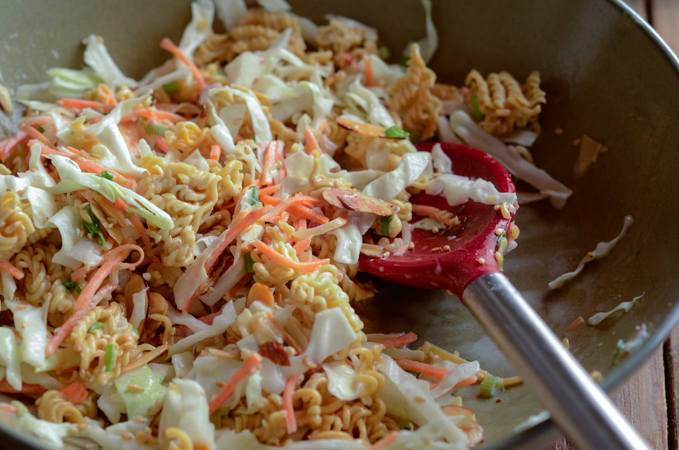 In a large mixing bowl, combine the cabbage, carrot, green onion, and the toasted ramen and almonds. Drizzle the dressing over and toss everything very well. Season more with salt and pepper according to your taste. Serve immediately. 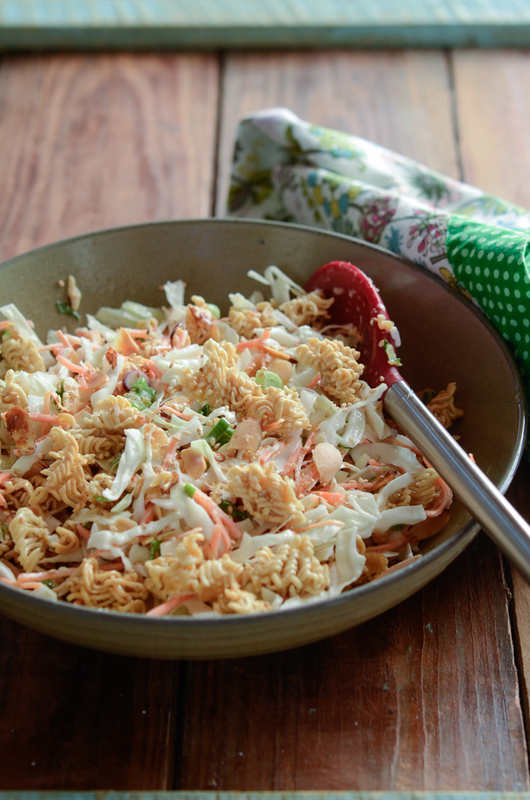 Use store-bought coleslaw mix package instead of slicing the vegetables yourself. I've had this salad before, but it's been years and years. Never made it myself -- I really should. Great looking recipe! Thanks so much. Hi GL Thanks for your kind message. I have been inactive for some time with new recipes. 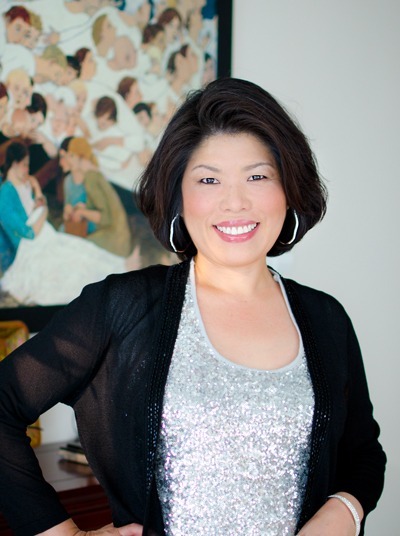 I am in the middle of relocating back to U.S these days, so blogging with recipes are quite difficult at this time. However, I am planning to move into my new house within a month, so I will definitely comeback to my blog again when things are settled for me and my family. Thanks for thinking of me. Have a great day!